This is the BIG ONE! GoDaddy is now offering a deep discount of 35% off the products and services you need for your online business: domains, websites, email and much more. These tools will help you grow your business for years to come. 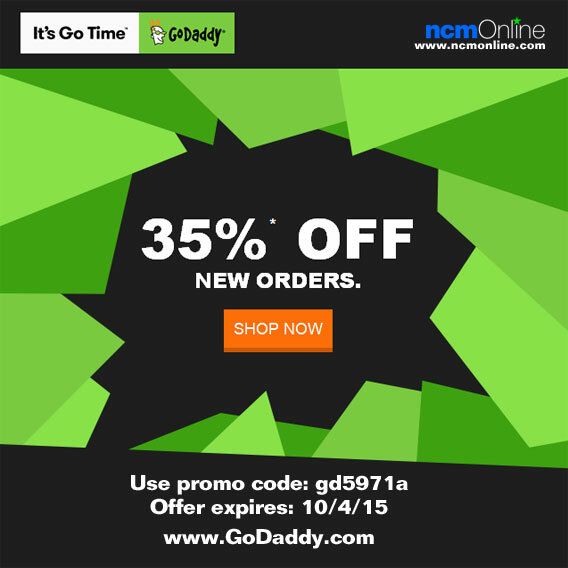 Buy today for 35% off new purchases of GoDaddy web hosting plans, domain names, and more. Use promo code gd5971a in your cart when placing your order. Offer expires Sunday, October 4th, 2015. Not applicable to ICANN fees, taxes, transfers, premium domains, premium templates, cloud server plans, Professional Design Service fees (including Web Design, eCommerce Design, and Logo Design), gift cards or Trademark Holders/Priority Pre-registration or pre-registration fees. Offer good towards new product purchases only and cannot be used on product renewals. Cannot be used in conjunction with any other offer, sale, discount or promotion. After the initial purchase term, discounted products will renew at the then-current renewal list price. 35% off offer expires Sunday October 4, 2015.